Amanda is the creator of mobiles for Just A Felt Dream. As well as running an Etsy shop, she is a wife and mother of 4. She loves creating custom pieces for her customers and encourages Mama's (and Dads) to be a big part of the creative process. As a mother I know it's one of the great joys in pregnancy to decorate your new baby's nursery. You gain a special kind of perfectionism when it comes to decorating this room because you have a vision in your mind and every detail has to match that vision exactly. It was this perfectionism that led me to start Just A Felt Dream. I got stuck on a nesting doll theme when I was pregnant with my third little girl even though I couldn't find a single piece of décor to match this theme. I found this beautiful fabric on Etsy that I made into her bedding and using this bedding I designed my very first mobile. Once I started sharing my design on Facebook I found more and more Moms who were looking for a custom mobile to fit their vision of their perfect nursery. With the help of these Mom's visions, my Etsy shop and designs grew. Since we live in such a DIY time I wanted to share a mobile design with you that’s fun to make and easy to customize! 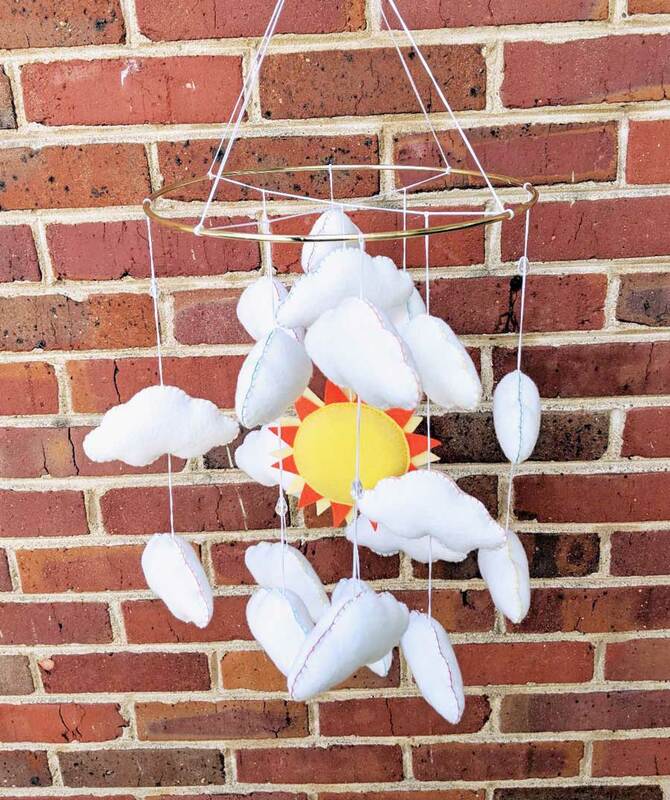 What better way to start the summer than with a beautiful summer sun mobile that brings some brightness into a nursery without all the light. 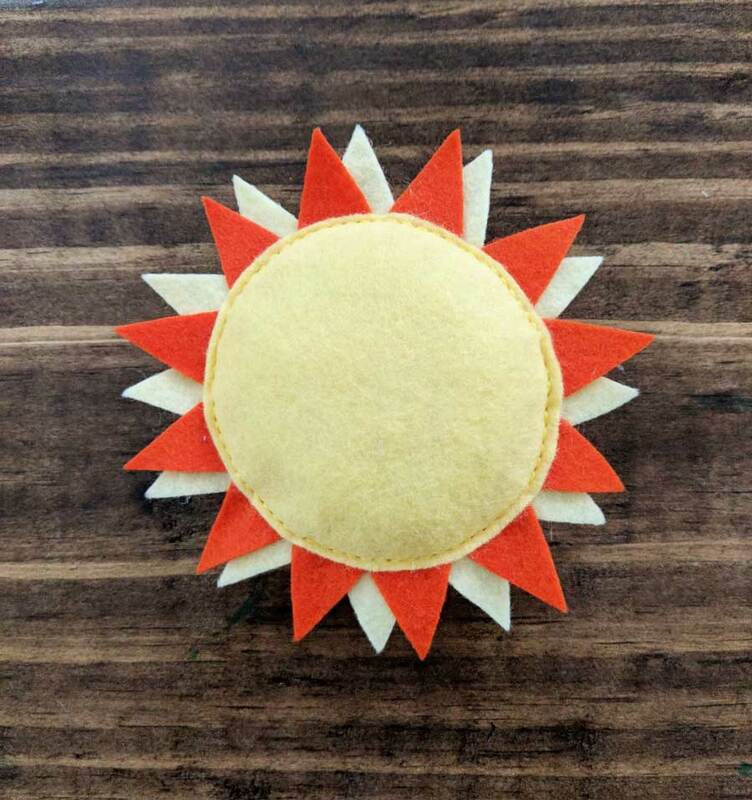 The last two colors are optional, you can use the same yellow felt that you cut the sun's circles out of for the decorations on the sun. Saves time and money. 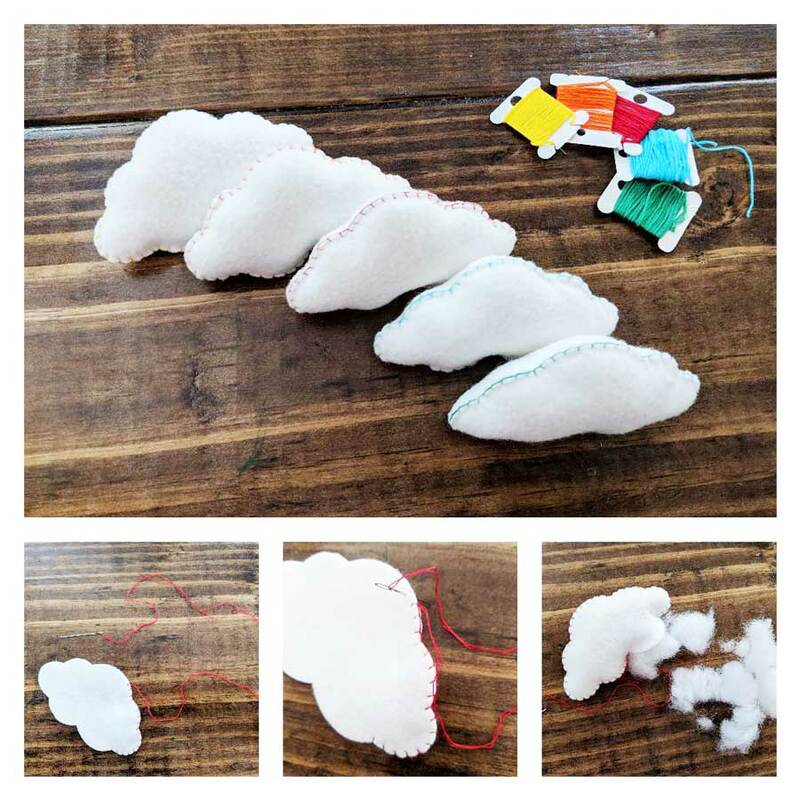 If you want to sew your clouds with a white DMC floss instead of rainbow colors then use B5200. First you need to string the hoop hanger. The 10" macrame hoop is your main hanging piece where your felt pieces are going to hang from and the 1.5" inch hoop is the hoop that the mobile will hang from. Cut 2 pieces of white crochet thread 68 inches long. Fold one of the pieces of crochet thread in half doubling the thread. Using the center of the crochet thread, loop the thread around the 10" hoop. Pulling the crochet thread tight across the hoop tie the other end of the thread directly across from the loop into a secure knot. Fold the other piece of crochet thread in half and using the middle of the thread loop it around the hoop half way between where the first piece of thread is attached. Pull this second piece of crochet thread tight across the hoop and securely knot directly across from the loop on the other side. This should make an X in the middle of the hoop. 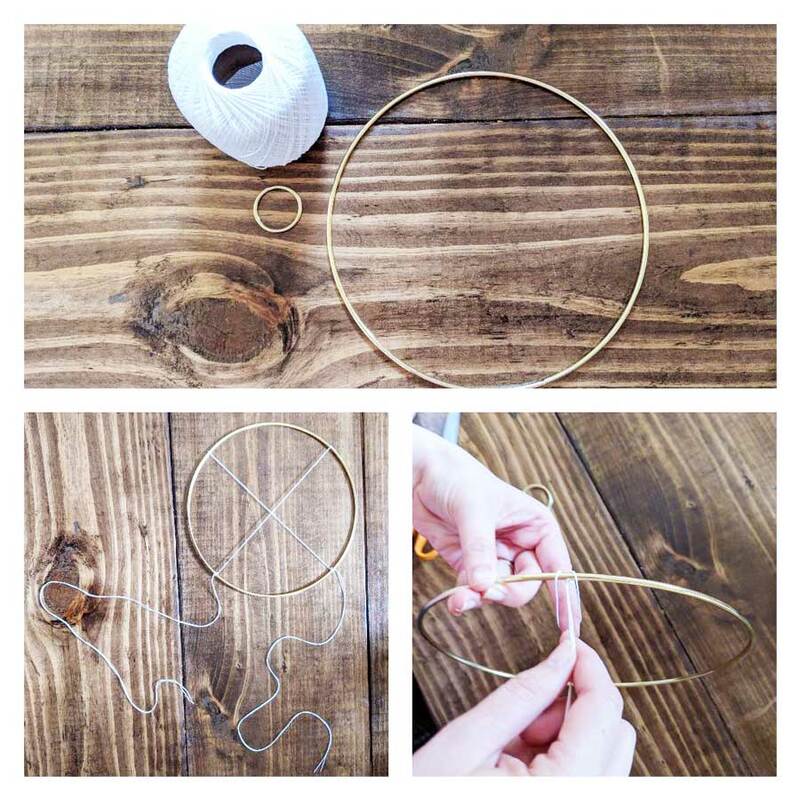 Leave the excess thread on the hoop, you will use these two long pieces to attach the 10" hoop to the 1.5" hoop. Next cut 2 pieces of crochet thread 50 inches long. Loop these two pieces of thread around the hoop where the thread touches from the X that doesn't have the excess thread. This will mean that each point of the X has a long piece of thread attached to hang from the 1.5" hoop. Grab the 1.5" hoop. Hold the four long pieces of thread on the 10" hoop up and before you tie them to the smaller hoop, make sure the 10 inch hoop hangs level. 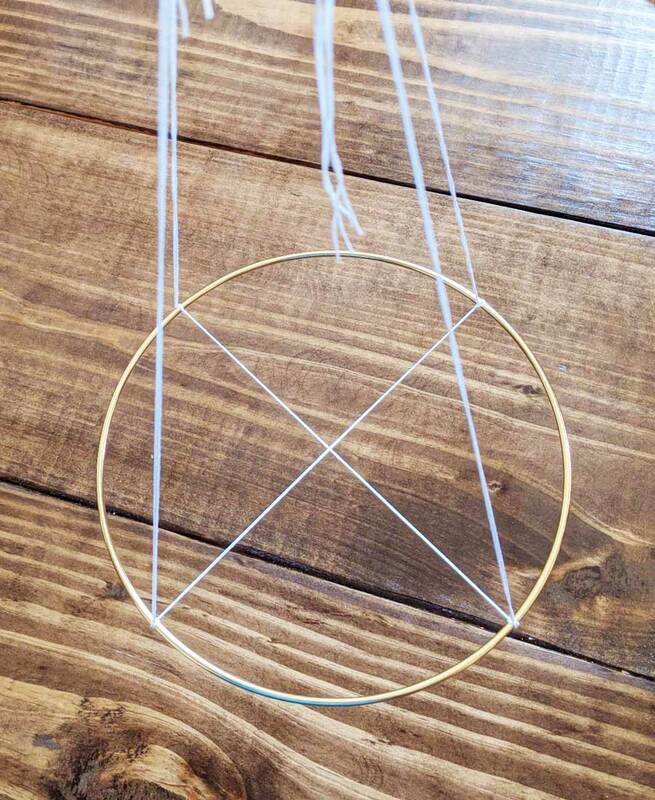 Once you have the 10" hoop level, tie the four pieces of thread together in a small knot 7 inches above the hoop. Then tie the 10" hoop to the 1.5" hoop using the knot as your placement for the smaller hoop. Double knot the thread, then Mod Podge the knot. After the Mod Podge has dried trim the excess thread. Cut 10 pieces of crochet thread 48" long. Take one piece of the thread and fold in half, use the middle to loop it around the center of the X. Take 4 more pieces of crochet thread and fold in half and loop 1 piece around each straight line in the X (center each piece). The last 4 pieces of crochet thread, fold in half and then loop around the 10" hanger in between the thread that hangs the hoop. 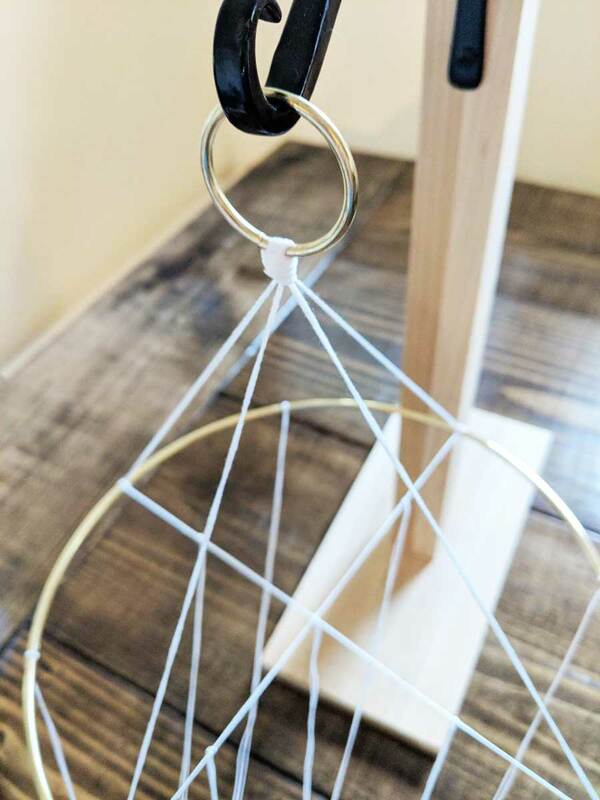 After you have the hoop strung, hang the mobile up and Mod Podge anywhere the yarn touches the hoop, all the looped joints of thread, and everywhere the thread has been tied. Allow to dry until hard. While the Mod Podge is drying on the hanger it's time to get your felt pieces ready to sew. Print off the pattern. 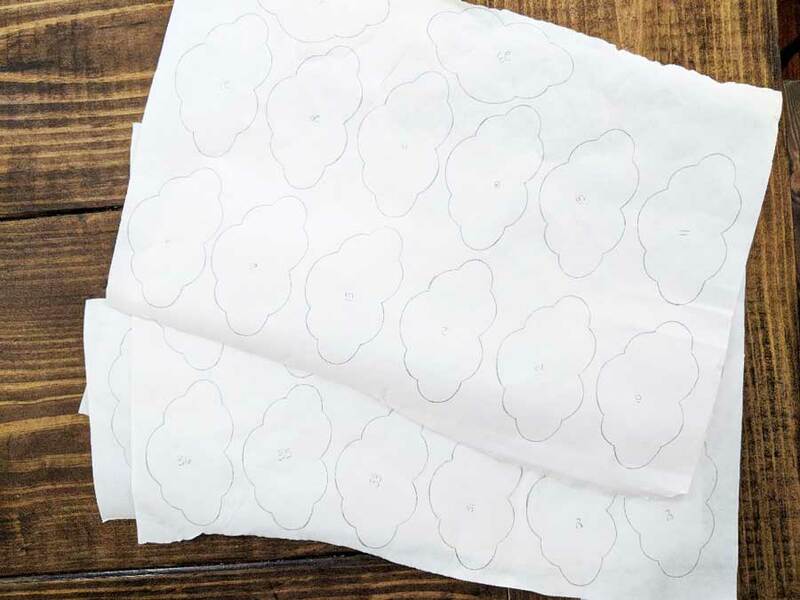 Place the freezer paper over the pattern and trace out 40 clouds, 2 circles, and # triangles. Iron the freezer paper with the clouds to the white piece of felt. 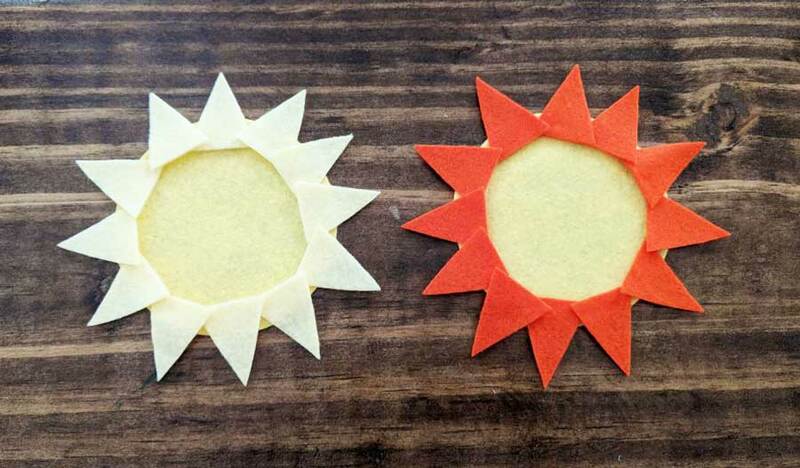 Iron the freezer paper with the 2 circles to the yellow piece of felt. Choose what color you want the sun's rays to be and iron the triangles onto that sheet, I used the lighter yellow (lemonade) for half and the orange () for the other half. Cut all your pieces out, with this pattern I cut on the line I traced; no need for a margin. Using the small(felt) needle your going to sew the clouds together; 4 clouds with #321 floss, 4 clouds with #947 floss, 4 clouds with #307 floss, 4 clouds with #3844 floss, and 4 clouds with #909 floss. 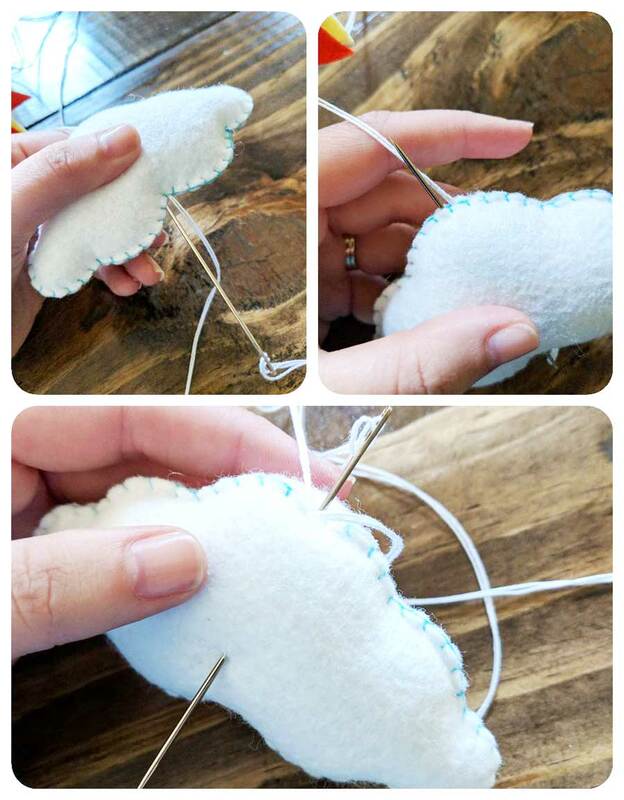 Place two cloud pieces together and using a whip stitch on the edge sew the pieces together, pausing and stuffing the cloud as you go. Make sure to stuff the cloud well, you should feel like you're overstuffing it! When you have the cloud stuffed close it up with a secure knot. Repeat for all 20 clouds. Lay the yellow circles down on your work space, placing the side you want showing down. Start placing the triangles around the edge of both circles. If using the lighter yellow and orange, place all of the light yellow on one circle and all of the orange on the opposite circle. To secure the triangles in place, use a SMALL dot of glue on the base each triangle and allow to dry. Once the glue has dried place the two circles together, triangle sides touching with triangles off set from one another. Using #307 floss sew the two circles together using a back stitch around the edge. Stop 3/4 of the way around to stuff the sun. Again over stuff it! Once stuffed finish sewing all the way around and close with a secure knot. To string the mobile you'll need a long needle, for this I use a doll making needle which are very long and come in different thicknesses. Starting in the center, thread the doll needle onto the middle piece of crochet thread hanging down. Thread one of the clouds through the center onto the piece of crochet thread. Move the cloud up onto the piece of thread where you want the cloud to sit on the mobile. Next thread the sun onto the same piece of center crochet thread. Move the sun into place. Thread another cloud onto the center piece of crochet thread, move into place. Then on the last cloud thread the crochet thread back up through the cloud from the bottom, making sure to loop the crochet thread around a stitch on the bottom of the cloud, and come out of the cloud next to where the crochet thread had originally gone in. Tie a small knot in the crochet thread, then thread the ends of the crochet thread back down through the cloud and push the needle out of the side of the cloud to hide the knot. Pull tight on the end of the thread and trim which will hide the end inside of the cloud. Using this method of stringing working from the center out, pick one of the four pieces of yarn hanging on the next level and string 3 clouds, securing the last cloud the same way you did in the center. Moving clockwise, string the next piece of yarn with one cloud and then a crystal tear drop bead. To secure the crystal bead, thread the bead onto the yarn and move into place onto the mobile. Then holding the bead in place thread the yarn back through the top of the bead and pull the yarn tight. This will keep the bead in place securely on the mobile. Thread another cloud onto the piece of yarn under the crystal bead and secure into place. Continuing clockwise, string 3 clouds onto the next piece of yarn. Then on the last piece of yarn on this level string 1 cloud, 1 bead, 1 cloud. Following this pattern you will have the exact same pieces hanging across from one another. For the outer layer, choose one of the four pieces of yarn hanging down and string 1 bead then 2 clouds. Moving clockwise, the next piece of yarn hanging down string 1 cloud, 1 bead, then 1 cloud. Next piece of yarn hanging down string 1 bead then 2 clouds. On the last piece of yarn hanging down string 1 cloud, 1 bead, then 1 cloud. This pattern will again have the exact same pieces hanging across from each other. To hang use a small ceiling hook and whatever type of decorative string or ribbon you want. You can use an extended crib arm to hang if you don’t want to use a ceiling hook. Really one of the best things about mobiles to me is how easily they can be changed around and customized so let your creativity go wild! Thank you so much for following along and have fun creating sweet dreams for the little one in your life!